Liz Did It: My Name Is Liz. L-I-Z. And I'm Off The Sauce. My Name Is Liz. L-I-Z. And I'm Off The Sauce. I’m a salad-dressing-making-aholic. Granted, I have created some delicious salad dressings over the last few months. But I realized recently that I just might have a problem. I was on a date last weekend and the following embarrassing conversation ensued. SALAD DRESSING??? That’s all I could come up with? SALAD DRESSING. Not lemon roast chicken, eggs benedict, homemade baked macaroni & cheese. Nope. Salad dressing. Which leads me into reason #736 that I am single. What guy sees himself with a girl who is really really good at making SALAD DRESSING?!?! He can look forward to a lifetime of lettuce and misery. I think I would have gotten a better response if I answered "Cupcakes for our future childrens' birthdays". What an idiot! I get it, I need an intervention. So today, I bought my first bottle of pre-made salad dressing in a long time. 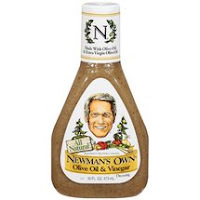 I went with Newman’s Olive Oil & Vinegar. Basic, but it got high ratings from Clean Eating Magazine. 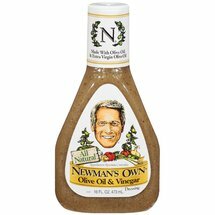 It’s delicious, and I love supporting Newman’s. So, I’m off the sauce for a while so I can concentrate on making some actual food.